Mish's Global Economic Trend Analysis: Chicago PMI Crashes, New Orders and Backlogs Plunge to May 2009 Level; Service Economy Headed for a Slowdown? Chicago PMI Crashes, New Orders and Backlogs Plunge to May 2009 Level; Service Economy Headed for a Slowdown? 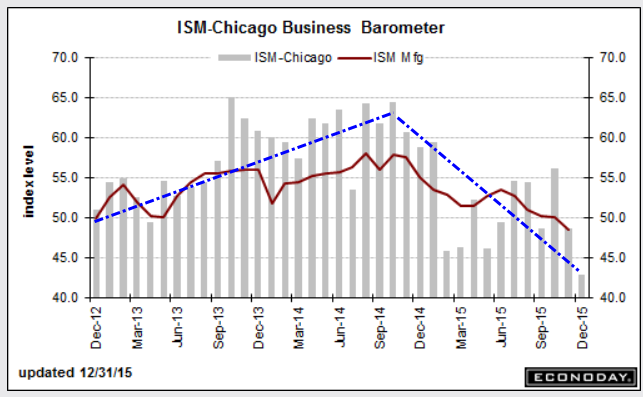 It was another disastrous month for the Chicago PMI. Economists expected a bounce back from last month's unexpected dip into negative territory. Instead the numbers reflect what's best described as a two-month crash. The Econoday Consensus Estimate was a guess of 50 in a range of 48 to 53. The actual reading of 42.9 was far below any economist's estimate. The December Chicago PMI tumbled to a reading of just 42.9, down 5.8 points. The reading was a fresh 6-1/2 year low and the seventh contraction this year. It also was far below expectations of a breakeven reading of 50. The biggest contributor to the decline was a 17.2 point plunge in order backlogs, to 29.4, marking their eleventh consecutive month in contraction. December's reading was the lowest since May 2009. The index also was depressed by ongoing weakness in new orders, which contracted at a faster pace, down 5.3 points to 38.8, the lowest level since May 2009. Both production and employment fell into contraction. The only component to expand at a faster pace was supplier deliveries, although some companies noted that the rise was influenced more by logistics issues during the holiday season and in preparation for Chinese New Year on February 8. The PMI continued to feel the ill effects of general sluggish demand and lower energy prices, which have left their mark on Chicago area companies, along with the stronger U.S. dollar. Moreover, well above normal temperatures has impacted many businesses that rely on cold weather. The Chicago PMI is a one of a kind, a regional report that tracks the whole scope of the economy, at least for Chicago. Big swings are the norm but one isn't expected for December with the consensus calling for what would be a small 1.3 point gain for this index to dead even 50, which is about where this index has been trending. It does not appear to me the index has been trending around 50 as Bloomberg suggests. The three jumps above 50 are counter-trend in a series that has been weakening for about a year. Service Economy Headed for a Slowdown? The Chicago PMI is a bit different because it contains a mix of both manufacturing and service companies. That makes matters worse given economists generally consider the service economy to be in good shape. Last month when the PMI dipped for the 6th time in 10 months (now 7th time in 11 months), I asked the question Service Economy Headed for a Slowdown? This month, Bloomberg relies on the old standby: the weather. Damn that weather. It's always too hot, too cold, or too right. This month it was too pleasant. Heading into the reports, it's pretty clear the economists did not know the Chicago weather was too good, otherwise they would have lowered their forecasts. Economists only learned Chicago's weather was too good following the PMI release today. Amazingly, economists don't even know about massive snowstorms until economic reports come out weeks later. Weakening services coupled with the biggest property tax hike in history will not do wonders for the Chicago economy. December 19: How Chicago "Works": Tax and Graft; Who Benefits? September 23: Chicago Tax Collector Hath Arrived With Massive Tax Hike: Emanuel Says "No Stone Unturned ... Not Done Yet"